Robert E. Howard did not leave us much in the way of personal writing advice. The few direct comments we have by him on the topic are gleaned from his letters, or revealed by Novalyne Price Ellis in her biography One Who Walked Alone. However, for decades fans and aspiring writers have been learning from him by studying his example. So, since Robert E. Howard was a master at story openings, it pays to take a look at some of the ways he begins his own yarns to catch a glimpse of what he may possibly have advised us had he spoken on the topic at greater length. 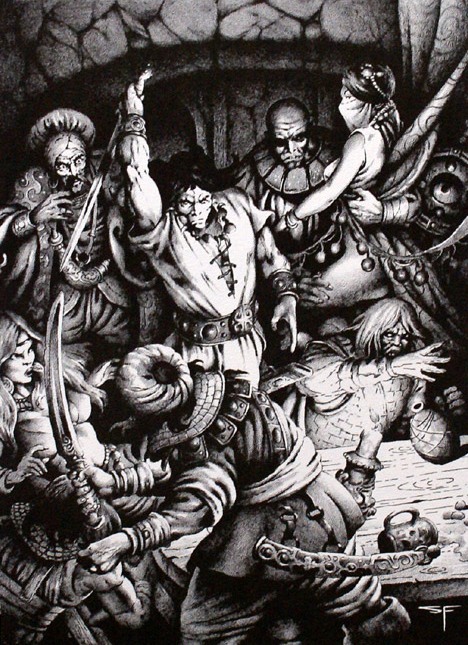 There are eight primary elements most often used by Robert E. Howard in opening narratives. I’ve included examples of each from his own fiction, primarily the Conan yarns. Do you begin with a character or with a description of a place or with a plot?” I asked. Kirby O’Donnell opened his chamber door and gazed out, his long keen bladed kindhjal in his hand. Somewhere a cresset glowed fitfully, dimly lighting the broad hallway, flanked by thick columns. The spaces between these columns were black arched wells of darkness, where anything might be lurking. In reality REH is not using these individually. He is artfully blending them together and chaining them in sequence for greater effect. The opening of Black Colossus for instance includes three: an exotic character (Shevatas) in an exotic location (Kuthchemes) fraught with an atmosphere of unseen menace and danger. In Red Nails Howard gives us an exotic character (Valeria) in an exotic location (primitive forest) added to which is a hint of mystery later when she glimpses the lost city of Xuchotl afar off. That implies the question of what is she doing here so far from her usual haunts. So there it is. A palette of eight opening methods which REH mixed and matched and chained in sequence for greater effect, using also contrast and incongruity to achieve additional resonance. Of course in actuality this is not so easy as it sounds, there’s an art to it. The creative judgement required is one of the writer’s most important skills, and that can only be honed from native talent by instruction, experience, feedback - and practice.